Wuxia. When I mention the word, I'm often treated with a blank stare and the question, "What's that?" According to Wikipedia's definition, wuxia "literally means 'martial hero,' is a genre of Chinese fiction concerning the adventures of martial artists in ancient China." From The Monkey King to Ip Man to the upcoming Great Wall, most Chinese action movies fall under the category 'wuxia' for their action-adventure style featuring various forms of martial arts. But once I convince someone to watch one of my favorite wuxia movies, often they come to me halfway through and ask, "What on earth is this? What did you tell me to watch?" I've taken to warning people before they begin a wuxia movie - it's not what they're used to, for several reasons. To help you out, and hopefully save you time in the future, I'm here to tell you how wuxia differs from other action-adventure genres. Wuxia thrives on exaggeration, which leads to many people wondering if the actors are overacting. To us, it may look like they are (and sometimes it's true), but for the most part, it's just a standard element of wuxia. It's more like theater-acting than normal film-acting. Facial expressions, tones of voice, and body movements are more intense and dramatic than in other film genres. Character arcs and storylines are often melodramatic. This isn't a case of bad acting, however, as many Chinese actors are extremely talented - it's just a typical case of wuxia, and if you see one of these actors in a different genre, you might be surprised at how understated they can be. does he look familiar? 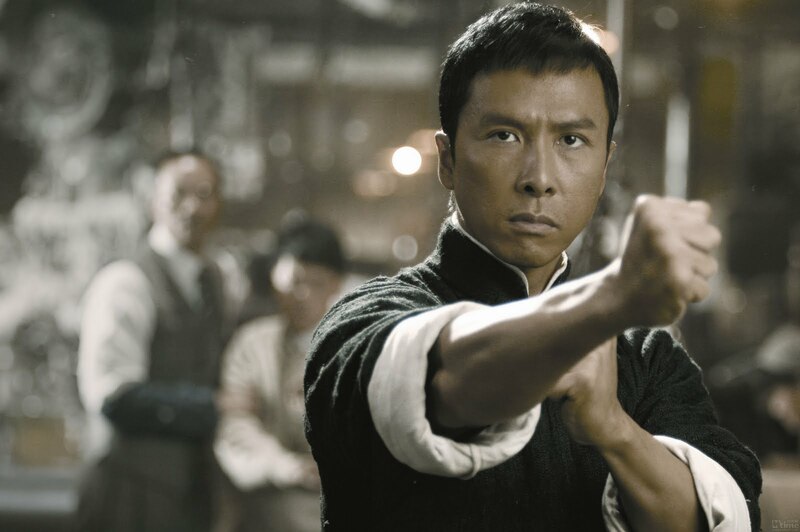 this is Donnie Yen, who you will soon know as Chirrut Imwe from Star Wars: Rogue One. The martial artists are real martial artists. If you're watching a wuxia movie, nine times out of ten you aren't getting an actor playing at martial arts - you're getting a martial artist who happens to be acting. It's one of my favorite cultural phenomena, the martial artist/actor role for wuxia movies, but from Jet Li to Jackie Chan to Donnie Yen, those famous actors are also martial artists. Granted, there's a use of wires and CGI because as I stated before, everything is exaggerated - but many of the fight scenes are coordinated by the martial artists themselves to lend some jaw-dropping authenticity to their fight scenes. They ask you to suspend your belief of what's humanly possible... frequently. In wuxia movies, it's completely normal to see someone jump thirty feet in the air, or higher. For no reason. A wuxia jump is more like a Superman jump. Characters can balance on feathers, they can fly for fifty feet, they can run up twenty-foot walls. When I first got into wuxia, I had a hard time with this aspect of it - because often wuxia doesn't feature a fantasy storyline where these things would be acceptable. Fortunately, you get used to it, and it becomes an enjoyable part of wuxia films. The editing is my biggest complaint with wuxia films. Sometimes they jump forward in time without telling anyone. Sometimes scenes are cut in confusing ways. Sometimes you get the feeling that vital scenes were cut because the characters seem to know more about what's happening than the viewer. Why is wuxia editing this way? I have no idea, but I hope the editing will improve to the point where I don't squint at every movie wondering what just happened. Wuxia is a mixed bag as far as quality goes. For the most part, wuxia movies are filmed for 3D, which lends an even bigger element to their already exaggerated quality. Sometimes the actors are fantastic and the plot is intriguing; sometimes they aren't. That being said, most wuxia movies will give you fantastic fight scenes, lush costumes, astounding creativity, and interesting character dynamics. Many people who don't watch wuxia have seen Crouching Tiger, Hidden Dragon - which I happen to think is a mistake. I've watched a lot of wuxia and only recently seen Crouching Tiger, Hidden Dragon, and I was surprised it took off in the USA so well. It's very mediocre, as far as wuxia goes - it features beautiful cinematography and some interesting storylines, but is by no means the best of wuxia. If you're interested in wuxia, I would recommend choosing from one of these movies: The Seven Swords, Ip Man, or Dragonblade. All are action-adventure movies rated R for strong violence (the Seven Swords features several non-graphic but sexual scenes) featuring excellent casts, with beautiful visuals and touching storylines. Do you still have questions about wuxia? Ask away! Actually, many of the actors are more dancers than martial artists, especially the females. Zhang Ziyi, Liu Shishi, Liu Yifei, etc. This is in part because it's more the story that drives wuxia than the martial arts. Americans tend to focus a lot more on the martial arts, which is fine, but wuxia is also about chivalry, romance, and adventure. A lot of modern anime has its roots in wuxia. If you're interested in more wuxia, I'd suggest Jin Yong's Condor Trilogy - it's sort of a wuxia staple, and there are some great versions available on youtube, especially the 2006 version of Return of the Condor Heroes.